Wait. This is the funeral for the BCS. It has no friends. I liked the BCS because I thought it preserved the excitement of college football’s regular season. You, the BCS’s enemies, countered that the regular season was nice and all, but you’d sacrifice some pre–New Year’s excitement for a longer postseason. That was essentially our argument, plus a lot of cuss words. Let’s put that aside for the moment, and let’s agree that whatever you thought of the BCS, it made the regular season really exciting. Take a single month of 2011. On October 29, Ohio State dealt Wisconsin its second straight loss and knocked the Badgers out of contention for the national title. Undefeated Clemson lost to Georgia Tech. Undefeated Stanford beat USC, 56-48, staying in the title hunt. A week later, on November 5, one-loss Michigan and one-loss Nebraska both dropped games. That night, millions watched no. 1 LSU beat no. 2 Alabama. The same night, though almost no one was watching, unbeaten Oklahoma State scored with 2:16 left to sneak by Kansas State. On November 12, 9-0 Stanford blew its chance at the title game by losing to Oregon. Boise State, which was 8-0, suffered a nut-kick loss to TCU when the Horned Frogs made a late two-point conversion and the Broncos missed a go-ahead field goal. The week after that, November 19, it was one-loss Oregon’s turn to get knocked out of the title game with their own missed field goal. Oklahoma, which also had one loss, got eliminated when Baylor’s Robert Griffin III threw a touchdown with eight seconds left. But the really amazing game was on Friday night: Oklahoma State lost to Iowa State in double overtime. It bounced the Cowboys from the national title game. What’s strange is that you, BCS enemies, used this near-constant state of excitement to attack the BCS. This chaos, you said, proved that the system was flawed. I dunno. 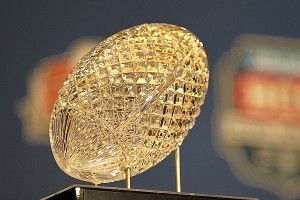 We can fight about the title game, but I thought the BCS made college football appointment TV every weekend. You painted the BCS as an anachronism, the last gasp of old-timey, bowl-riffic college football. But the BCS wasn’t old-fashioned. It was radical. the ‘90s. In 1990, Colorado and Georgia Tech ended the regular season at no. 1 and no. 2. They played in separate bowls. It was terrible. The same thing happened in 1991 and 1994. The last pre-BCS season, 1997, ended with a classic non-matchup: 11-0 Michigan, with Charles Woodson, and 12-0 Nebraska, with Scott Frost and Ahman Green, playing in bowl games 2,000 miles apart. Let’s stay in 1997 for a moment. We don’t just see a sport full of controversy. We see a feudal society. Major conferences, smallish conferences, bowl games yoked to deep histories, rival polls, computer rankings, and the proudly independent entity called Notre Dame — all these things vied for power. The BCS’s great achievement was bringing this world under its thumb. This turned out to be a really hard thing to do! The BCS had to account for the fact that, say, the Big Ten champs still wanted to play in the Rose Bowl every year. The BCS had to be elastic enough to welcome both undefeated Boise State and a four-loss Big East champion. If the eventual rules were convoluted, that only underscored the enormity of the task. and, well, you see where this is headed. But notice that nearly every fan agrees that some central authority should do the choosing. The BCS was the first, imperfect stab at forming a government. It was college football’s Articles of Confederation. You had two killer arguments against the BCS: (1) the LSU-Alabama rematch, which you said proved the system sucked, and (2) the fact that the BCS didn’t offer a realistic path to the national title for TCU, Boise State, and the other small schools you regularly martyred in the sports pages. The second argument is mostly true. But the BCS helped those small schools, too. TCU played in the Rose Bowl and the Fiesta Bowl. The Horned Frogs hadn’t made a major bowl since the late 1950s and weren’t going to under the old system. Their success made them so big-time, they got into the Big 12. Utah played in two BCS bowls and won both. They went from a résumé-filler for Urban Meyer to a Pac-12 member. Boise State jumped from the Humanitarian Bowl to two BCS games. Hawaii played in the 2008 Sugar Bowl. Look at yourselves. You’re a rainbow coalition. You are Texas fans and Oklahoma fans, LSU fans and Alabama fans, Utes, Broncos, Horned Frogs. People who, on a normal fall Saturday, hate each other. The fact that you can hate together could mean good things. Because there’s a lot more to hate about college football. In fact, there’s an obvious next target: the fact that college athletes aren’t paid. The BCS was a decade-and-a-half-long annoyance; the whole idea of “amateurism,” as Brother Branch pointed out, is a century-long swindle. It’s a moral crisis. It’s more important than Oklahoma State getting stuck in the Fiesta Bowl. The truth is, everyone wasted too many words on the BCS when the real crisis was right in front of us. As the crystal football is lowered into the earth, friends, let us all join hands and hate college football’s phony notion of amateurism. In a few years, I’ll save you a seat at the funeral.